So I recently got myself a brand spanking new 4K (UHD) TV. 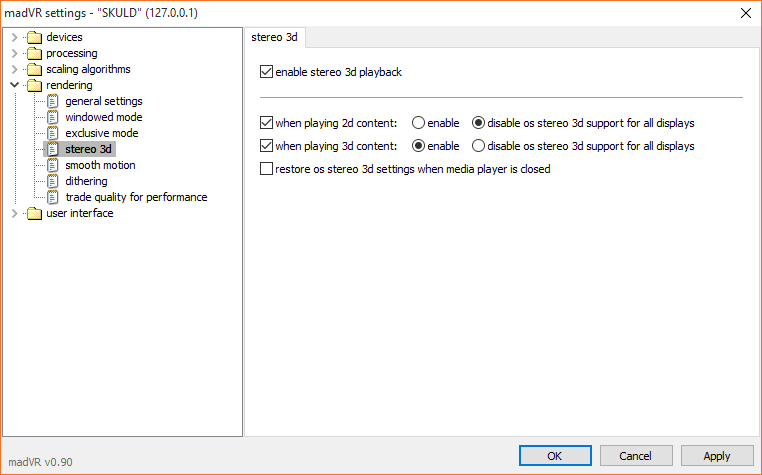 Now, for reasons I have been unable to figure out, I have been unable to get MadVR to enter fullscreen exclusive mode (and thus hopefully help with smooth playback) on the TV. If I change the output to the TV to 1080p, I did manage to get it to work (although then it stopped again for some reason). FYI: Exclusive mode is working fine on my normal monitor. Why do you need exclusive mode? Since Windows 7 it has always played smooth for me without it. I'm guessing it's a gfx driver problem. Do games and such work fine on 4K? Yeah, everything else seems fine. When I say smooth, I mean during like panning shots, that sort of thing. I have never been able to get that smooth without being in exclusive mode. Yeah, I assume you have you refresh rate set to 60 Hz then? I have it set to 24 Hz, which is why I don't need the exclusive mode. It might be that your gfx doesn't support 24 Hz refresh rate at 4k resolution? Try setting your refresh rate to 24 Hz. If it's not in the list then you know that's the problem. Refresh rate on TV is 30 at 4k, which I guess will present the same issues were it to be at 60. As for smooth motion in MadVR, don't really like what it does as it makes it look blurry for an instant where the judder would have been. I guess the solution really is to figure out how to get it to output at 24, or force everything to 30. Try changing the textbox in the image below to 3840x2160p23 (or whatever res your screen is) and set the options to change when it goes to full screen. Ah, found a way to get the output to go native 24hz which seems to have done it. The above tactic was my next move.